Since the summer of 2005, Tulane’s URBANbuild program has realized a body of work in New Orleans comprised of the efforts of student design and construction, close faculty mentorship, and collaboration with a number of local community partners, fabricators, vendors, and material suppliers. 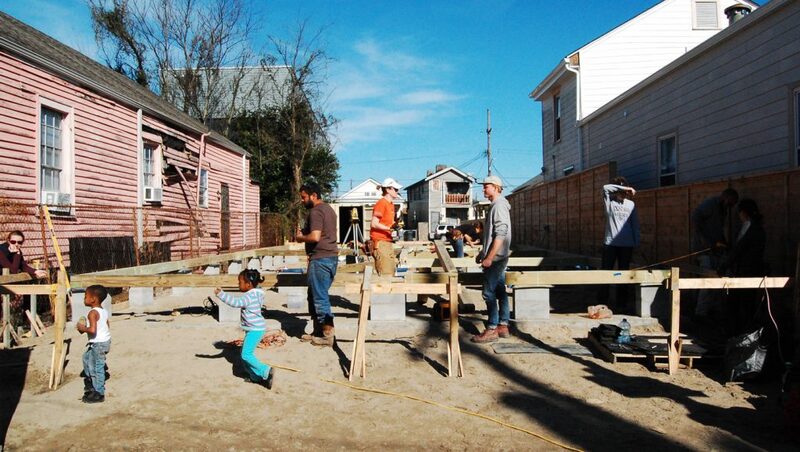 The program charges students with the task of developing responsible housing prototypes with reliance upon analysis of New Orleans’ existing neighborhoods and the community’s common cultural needs. In addition, students are asked to recognize the expectations and abilities of our region’s workforce while striving to build upon and challenge available means in pursuit of progress. In both the design studio and in the field, equal attention is given to conceptual contemplation and technical execution; reasons and methods are simultaneously considered. However, even in the face of these limitations, it is rewarding to realize that our program has produced habitable structures for families within some of the city’s most struggling neighborhoods, as well as a body of research. However, even in the face of these limitations, it is rewarding to realize that our program has produced habitable structures for families within some of the city’s most struggling neighborhoods, as well as a body of research. The chief aim of URBANbuild students and faculty—to provide higher quality design projects to underprivileged communities with an awareness of affordability—could not be achieved without key community partners and organizations. The majority of completed structures have been realized in collaboration with Neighborhood Housing Services of New Orleans (NHS), but other projects have been developed with the Make It Right Organization of New Orleans (MIR), as well as with Harmony Neighborhood development. NHS has worked collaboratively with the School of Architecture since the program’s inception; together, we have overcome a number of obstacles along the way. Our work with NHS has exposed students to the many needs of New Orleans’ neglected residents and has given students the opportunity to identify possibilities for the revitalization of our city’s urban fabric. The mission of NHS is to create and sustain healthy and vibrant neighborhoods through real estate development, education, and community building activities that improve the quality of life for all residents. The School of Architecture recognizes and appreciates NHS’s mission and is committed to continuing this vital partnership through the provision of inventive, affordable, and well-constructed homes. Our discipline’s definition of affordability has included a variety of considerations in recent years, ranging from the immediate costs of construction to the operating costs of the finished product. In seeking to develop high-quality, affordable housing prototypes, students face the many limitations presented by the construction industry, city agencies, and user groups today. However, it is rewarding to recognize that, even in the face of these limitations, the program has produced a body of creative research and habitable structures for families within some of the city’s most struggling neighborhoods. Moving forward, students will continue to gain exposure to the larger network of materials and systems providers and will seek the support of researchers concerned with new technologies and building sciences. We invite support and participation. Questions may be directed to me via email. On behalf of all students and faculty that have influenced our ever-developing mission, I extend many thanks to those who believe in the work we do. Our work with NHS has exposed us to the needs of the city’s underprivileged families and what is required for the revitalization of New Orleans’ urban fabric.